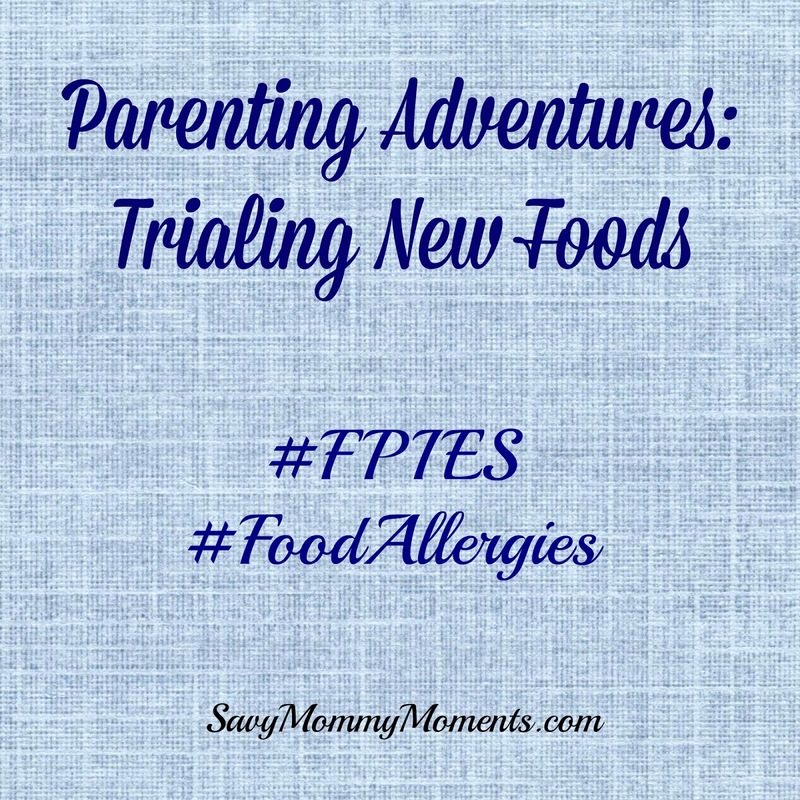 This part of our FPIES adventure focuses on the food trials and adding new foods to Savy Baby's diet. As you may know, our sweet baby started showing symptoms when trialing her first foods at 6 months old and then we were given an official diagnosis of FPIES when she was 9 months old. After the diagnosis, our focus was slowly adding in new foods to her diet. These foods would be focused specifically on adding protein and iron to her diet. We were given the following 5 day trial plan by our allergist. After each day' trial amount, we were to pay attention for any changes that would alert us that she would likely have an acute reaction (i.e. severe diarhea or vomit and/or shock) if given a full serving (1 tablespoon or more) of the food we were trialing. The symptoms we were looking for could include: excema on her body, mucusy and/or loose stool, screaming pain, severe restlessness, vomiting. These symptoms would likely appear 2-3 hours after ingestion. Once we notice one or more of these things, we are to stop that food immediately and write it down as a failed food. Then we give her body a rest for a week or so and trial the next food. When we started we were really nervous, but knew that we had to move forward with adding foods to her diet in order for her to have a chance to grow without the use of expensive formulas and/or a feeding tube. Prior to this list, we had only 2 safe foods, carrots and winter squash, so it's amazing that we were able to add so much to her diet in a 3 month period. We didn't end up having a single fail, which was much to our surprise and delight! The biggest thing that this did for her was provide her with growth in both height and weight. For the first time in months she was finally back on the growth curve for height. We would continue to return to the pediatrician every other month for height/weight checks. When she was 13 months old, we returned to the allergist for patch testing. This testing involves taking common FPIES triggers like oats and placing them on little patches all over her back. The patches stay on for 48 hours and then we remove them at home and take pictures. Then we had to wait an additional 24 hours and take her back to the allergist to read them. The foods that we patch tested were oats, rice, wheat, barley, rice, rye, soy and corn. After 48 hours we removed the patches and there really wasn't anything noticeable on her back where the patches where. Even the next morning they weren't very noticeable. 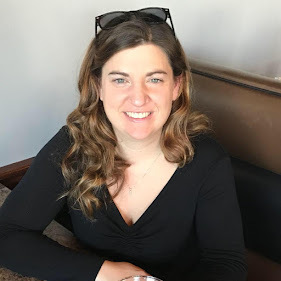 However, by the time we got to her appointment that afternoon, there were noticeable little bumps and redness in all of the circles, with the exception of the control patch which was saline. I mean, I literally said "Those were there this morning!" when I took her shirt off for the doctor. The doctor laughed and said "Yep, that's why we have to wait the extra 24 hours after you remove the patches. The reaction time is 72 to 96 hours after applying the patches." This made complete sense as I looked at the pictures from the day before and there was literally nothing on her back from them other than outlines of the little patch disks. The conclusion was that she had "failed" every food, some worse than others. Unfortunately, this meant that we could not move forward with testing any of these foods at this time. We went home from the appointment slightly disappointed, but it was nice to know that those foods just weren't a possibility for her at this time. She would return to the allergist in 6 months to have the testing repeated. After this testing, we also realized that the constant diaper rashes she was getting were likely from her exposure to a derivative of corn that was in her powdered formula. We switched her to the RTF (ready-to-feed) version of it that didn't have the corn derivative and her rashes all but went away completely. In these 4 months, we did come across one fail: Peanuts. On day two of the trial, she had a very noticeable reaction in her stool and we had to stop it immediately. This is one of the examples of why the trialing system we use works. It's very likely, had she been given a full serving, peanuts would give her a vomiting and/or shock reaction. We have fun figuring out ways to make foods like muffins, pancakes, and flatbreads with the ingredients that are safe for her. I recently posted a recipe for Quinoa pancakes that she loves! One of the biggest things for us is keeping the good, bad and future trial foods all organized for us and our nanny/family. I decided to use Microsoft Excel and create the spreadsheet below. 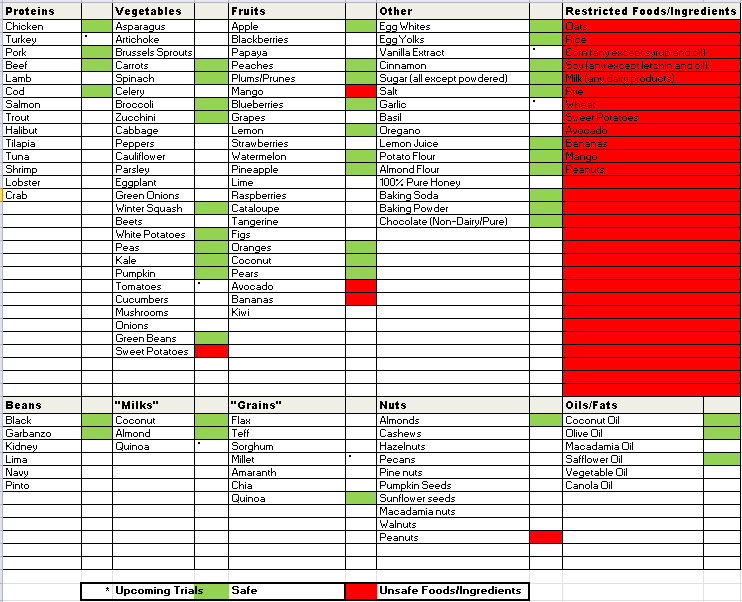 The spreadsheet lists all the potential trial foods by "category" and then highlights them in red/green if they are a pass or fail. Then I put asterisks next to the foods that are upcoming trials. It's really been helpful for anyone who comes into our home to see as well as a great reference for us and our nanny. At this point, we will continue to trial additional foods as we expand her diet. 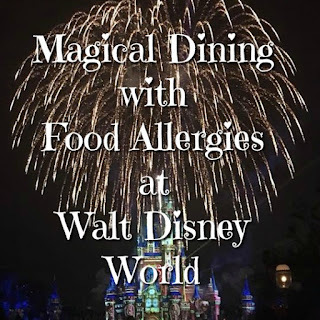 In June 2015, she will return to the allergist and we will perform the patch testing again for the same foods. If she passes any of them, we will then create a plan to trial the foods that didn't react to the test. This plan may involve doing it in a more controlled setting like a hospital, just in case of a severe reaction, so that IV fluids can be administered immediately to prevent shock. Until then, we move forward and do our best to expand her diet safely. She will remain on her formula until our team of doctors feels as though she is getting enough essential nutrients for growth and development from her diet to cutback and/or remove the formula completely.